So unlike most of you reading this post now, we're right in the middle of winter, here in Australia. Not just that, we're in the middle of a polar vortex at the moment. They say this is the coldest its been in the last 20-30 years ... brrr!!! A nice warm, hearty bowl of soup hits the spot at a time like this. I've always wanted to try some split pea and ham soup. This recent weather seemed like the perfect opportunity. After looking around the internet for a recipe, I found one I was happy with. I picked up all the ingredients I needed and got to work. I was happy with the fact that I found a pressure cooker recipe, which meant that I could sit down to a nice bowl of soup in a fraction of the time. Since its the middle of the year, I didn't have any leftover ham. But for those of you that bake a leg of ham around the holidays, using your leftovers would be perfect for this recipe. I bought some smoked ham meat from the supermarket and used it. When I think back, I think I'd be happy even without the ham in the soup. 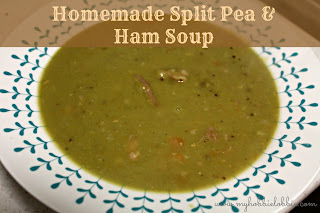 The split pea soup is so flavourful, a vegetarian version would be really delicious as well. All this without the fuss of having to spend hours developing flavour. Rinse the peas under cold water. Heat oil in a pressure cooker under medium heat. Add the bay leaf and onion and saute till onions soften up. Add the garlic, carrots and celery. Add the peas, crumbled cube and water. Cover and bring to a boil. After it reaches pressure / till the first whistle, simmer on low heat for about 20 minutes. Take off the heat and let the cooker release pressure on its own. When it is safe to open, adjust liquid by adding water if needed. Adjust salt and freshly cracked pepper if need. Add the ham, remove the bay leaf and let the meat heat through. If the soup feels like it needs more cooking, cook till it reaches the desired thickness. ** You could use stock instead of the cube and water if you have any at hand. ** This soup keeps well in the fridge. My pot lasted us about 10 days. I just took out small portions and heated it up as I needed it. ** I found that the soup thickened after refrigeration. So each time I need to heat up a portion, I added some hot water to the portion I was heating up, to reach the consistency I like and then heated it through.